It’s not news that the state of Florida is jam-packed with possibilities for visitors. In fact, there is probably not a tougher market in the world for a tourist attraction to establish itself as a premier destination. So when a resort that is not located right on the water manages that feat, it’s worthy of note. We’re talking the PGA National Resort and Spa, in Palm Beach Gardens. Now, to be fair, the resort is only about a 20-minute drive from several beaches on the Atlantic, but that’s not the reason people come here. They come to play golf. They come to enjoy the spectacular spa. They come for very fine dining. And once a year – in 2019, from February 25-March 3 – they come for one of the best PGA Tour golf tournament/parties of the year, the Honda Classic. For that, they come in the mega-thousands – last year’s tournament attracted 224,642 visitors. During the Honda Classic, the normally relaxed lobby bar of the resort becomes party central, and getting from the course to your room can involve a fair amount of maneuvering, a bit of spontaneous dancing, and perhaps an embrace from an enthusiastic celebrant. So it’s pretty obvious that the PGA National Resort is two attractions in one, both pretty special. During the week of the Honda Classic, it is a fully-amped celebration; the rest of the year, it is a terrific getaway for vacationers of all kinds. Especially, of course, for golfers. 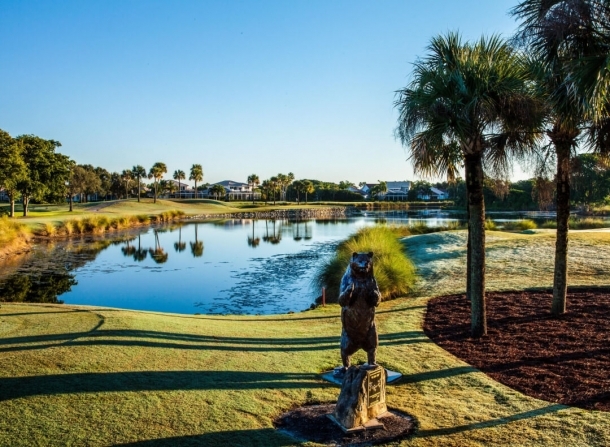 Because the resort features five superb golf courses, including the really tough Champion course that hosts the PGA players – the course with the famed “Bear Trap”, so named after designer and golfing legend Jack Nicklaus. But there are four more, and amateur golfers will find them a bit more playable (although do play the Champions – but perhaps, forget to keep score). The resort features on-site courses designed by Arnold Palmer , Tom and George Fazio, Tom Fazio II, as well as “The Estates”, part of the package, but located five miles west of the resort. Personally, I love the Palmer course. It’s challenging but doable, and like many Florida courses, includes a lot of water features. The 18th hole finishes across the water from the Champions’ 18th, offering a terrific vista to every golfer willing to focus on the view instead of his or her putt. The Champion course, by the way, was closed during the summer and early fall of 2018 to improve the already pristine playing conditions. 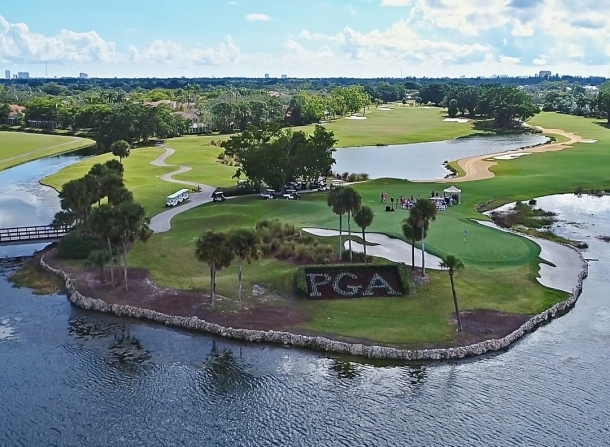 One thing every golfer should appreciate about the PGA National Courses is that every course offers a number of distance options. The Champion has five tee blocks on every hole, with the course ranging in length from 7045 yards (don’t even think about it) to 5145 yards. Some of the courses add more variety by suggesting combination totals. So there is a course set-up for every golfer, regardless of handicap or age. Enough about golf. If that were even possible. The PGA National Resort offers a huge variety of accommodation options, from (of course) guest rooms to suites to cottages to vacation home rentals. All first class. Cost of accommodation varies dramatically according to season, topping out, of course, during the PGA tournament. Canadian visitors would be smart to check on line for costs, and take advantage of the shoulder season rates, which can be half the price of high season. Almost as popular as the golf courses is the Spa. In addition to the kinds of services and treatments spa aficionados would naturally expect, this spa features Waters of the World, the centerpiece of the spa, featuring two outdoor mineral pools. The spa also features an astonishing, 17-option list of massage treatments, and so much more – right to the Waters of the World Café, beside the mineral pools. There are plenty of dining options at the resort, from the pool-side Wave Bar & Grill, to Bar 91, with some very comfortable outdoor dining options. But be sure to dine at Ironwood Steak and Seafood, which has won an Award of Excellence from Wine Spectator Magazine. PAG National Resort is also a handy base to explore the attractions of the Palm Beaches area, including Whitehall, the museum houses in the home of railway and hotel tycoon Henry Flagler; and the Kravis Centre for the Performing Arts, which hosts top entertainment throughout the year. But frankly – once you check in to PGA National Resort & Spa, it will probably take a lot of convincing to get you to leave the premises. It’s just that good.